LiveChennai is the No,#1 favourite of the browsers having won the utmost trust from them furnishing 'on-the'spot' details of all market status. 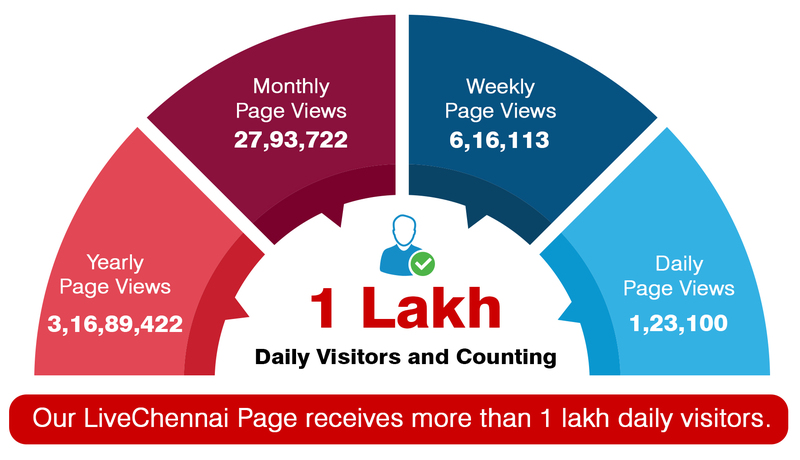 Also LiveChennai.com is one among the leading news portals in Chennai. With more than a decade of successful existence, we bring to you reliable and authentic news updates predominantly from Chennai. Our portal has a tremendous reach among wide mass of audience who look for high-quality info. By advertising with us, you open up the pathway to reach wide spectrum of people and also grab the opportunity to share the trust that we have built with our audience thus far.